Using essential oils safely in pregnancy and beyond. During pregnancy the body and mind is subject to new stresses and strains, and as the months progress, it can be easy to feel more than a little fatigued and emotional. Traditional methods of unwinding might not be recommended for you now, so it might be time to explore a few alternative ways to de-stress instead! The use of essential oils in pregnancy can be a wonderful way to lift moods and soothe aches and pains, but it’s important to know what you’re doing. We’ve put together a quick guide to using essential oils safely in pregnancy and beyond. Before you start to use essential oils for the first time, please seek professional medical advice to ensure the safety of yourself and your baby. Always read as much information as you can; essential oils are derived from plants and should be used sparingly. Be informed, and make an informed choice. Always buy your essential oils from reputable sources, and never use if you are not in good health. Avoid all essential oils until after 12 weeks of pregnancy. The oils extracted from plants are highly concentrated, and once they are applied to the body they are absorbed by the skin. Experts are not yet aware of the full effects of all essential oils, but it is suspected that they could be able to cross into the placenta. This means that you must be careful when using them, and always follow safety precautions. ● Lavender- not only will it help to relax you and aid a good night’s sleep, but lavender can also be used to treat stretch marks too. Mix with a carrier oil and apply to the skin to prevent stretch marks appearing. Massage well, and relax. ● Bergamot. This is a light and refreshing oil with a citrus fragrance and it can help to relieve pain and lift moods- making it great for combatting the rollercoaster of emotions that pregnancy and parenthood brings. Bergamot it also known to relieve the symptoms of indigestion. Mix two drops of Bergamot with two drops of orange and one drop of Neroli for a blend that will settle your emotions and clear your mind on an unsettled day. ● Lemon- a wonderful antidote for morning sickness and nausea. ● Neroli- a multi-purpose oil that has the ability to soothes aches and pains in pregnancy, and resolve digestive issues too. Neroli is also wonderful for tackling anxiety and depression and is known to aid sleep in the last trimester. Additionally, Neroli can help to promote skin cell regeneration so that you really can have that pregnancy glow after all! You can also add one drop of Neroli to one drop of Roman Chamomile to relieve anxiety and fears surrounding pregnancy and birth. Mix the blend with a teaspoon of base oil, rub into the palms of your hands and inhale deeply. ● Rosewood- this is an essential oil for sleep-deprived mums, as it has a mild sedative effect that will help relax you for a good night’s sleep. Mix one drop of Rosewood to one drop of lavender and one drop of Neroli. The blend can be used to quieten the mind and spirit. ● Sandalwood is a powerful anti-depressant and can help treat symptoms of cystitis during pregnancy. Some essential oils are wonderful for the postnatal period and can be used effectively with baby too. As always, use with caution and make sure you take safety precautions at all times. ● Vetiver is a wonderfully calming oil that will help to calm and stabilise moods, and can be used to effectively treat postnatal depression. It should be noted that vetiver can be either be inhaled from the bottle, or diffused in a room but only when baby is over 12 months of age. Room sprays or oils in water can be used once baby is over six months. ● Fennel and clary sage can be used to stimulate milk supply for breastfeeding mothers and this combination is known to be very effective. Make a massage oil for the breasts by adding 10 drops of each essential oil to two tablespoons of grapeseed oil. Blend together and massage into the breasts in a gentle, circular motion. Ensure excess oils are removed before feeding baby. 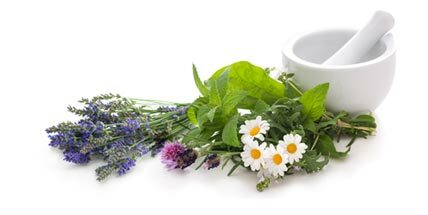 ● Roman chamomile and lavender can be used to treat nappy rash and other minor skin complaints. Newborn babies will need the following blend to be halved: Mix one drop of each oil to a carrier oil and apply gently to the skin. Some essential oils are not recommended for use during pregnancy, and all essential oils should be used with caution after birth too. When you use essential oils in pregnancy, make sure you use just one drop of oil at a time and limit use over longer periods of time. If you add oil to a bath, dilute if first by mixing with at least a teaspoon of a carrier oil- grapeseed or almond oil are perfect for this.